Winter always seems so colorless to me. Gone are the bright pinks, yellows and oranges of spring, replaced with dull green lawns and bare tree branches. After the rush of color of changing leaves in autumn, we are in some desperate need of color to get us through the winter. Thank goodness for the birds! 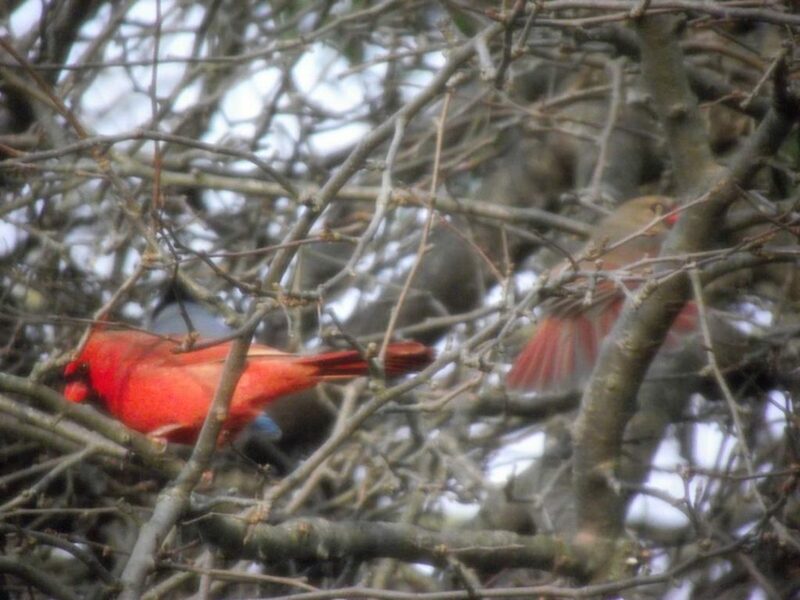 If you’re lucky and looking, you’ll find a reprieve in the bright blues of blue jays and the fiery red cardinals. 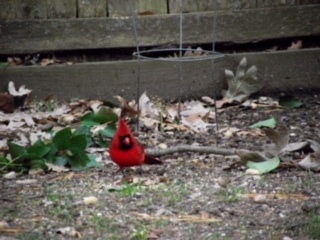 Today I’m sharing about the cardinals that visit my bird feeders. With so many sports teams named for this bird, their name is almost common place. They’re also the most popular state bird with seven states – Illinois, Indiana, Kentucky, North Carolina, Ohio, Virginia, West Virginia – claiming the vibrant red bird. While many people may not be able to name more than a handful of birds, it seems everybody knows a cardinal when they see one. That fiery red bird is unmistakable. What some people might not know is that it’s the male that gets all that recognition. 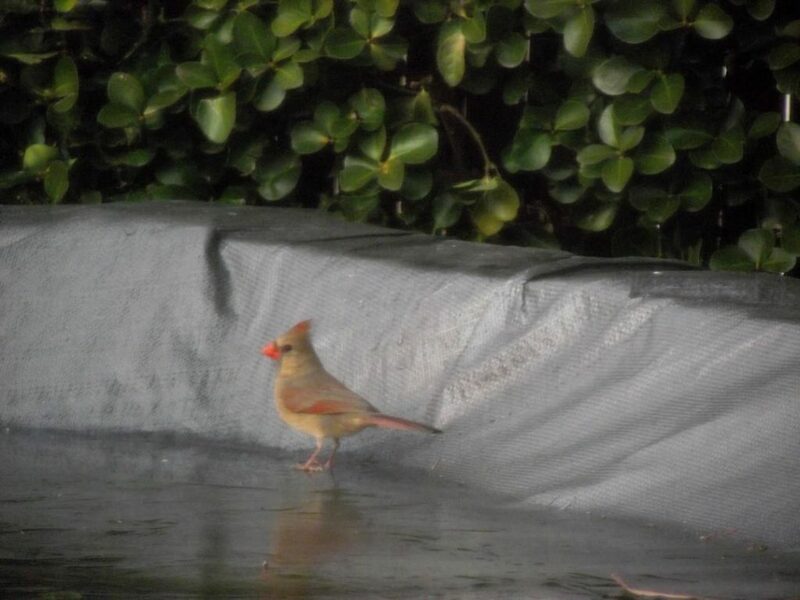 Oftentimes, the female cardinal goes by unrecognized due to the fact that, unlike the male, her color is a tawny brown with only red accents. 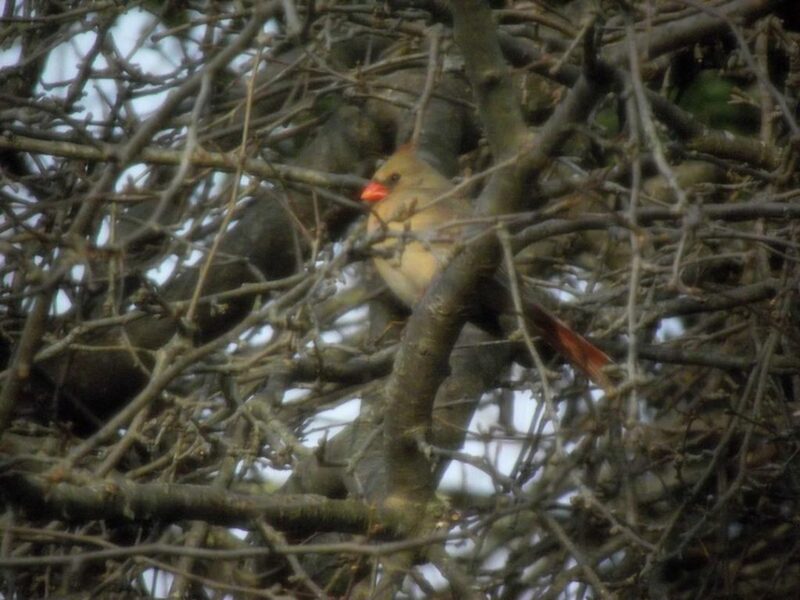 However, her bill is red like the male cardinal. The male cardinal also has a black face mask over the eyes whereas the female’s mask is less defined and a gray black in color. Often seen in pairs, I have a regular couple that feed at my bird feeders. 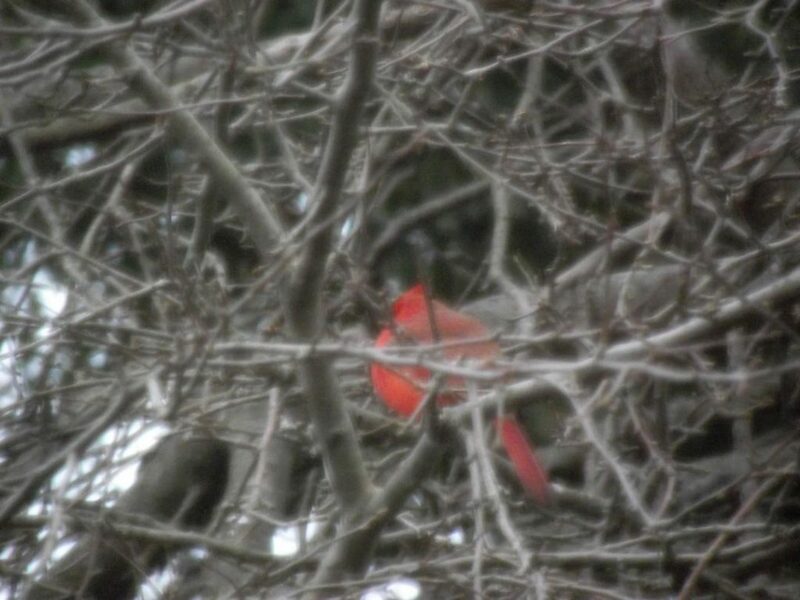 Many people associate the cardinal with the arrival or winter, or even Christmas. It’s a common theme found on Christmas cards and other Christmas ornamentation. However the cardinal is a non-migratory bird, though some will leave in fall. If you spot a rather ‘fluffed’ up cardinal perched on a snowy branch it’s using its unique ability to trap warm air next to its body to prevent the cold air from reaching its body. A fairly large bird in comparison to a sparrow, the cardinal is eight and three quarters in size, almost three inches smaller than a blue jay. Unlike the blue jay, the cardinal is rather shy around feeders, tending to approach them just at dawn. If there’s a crowd around your feeder, chances are a cardinal is waiting for its turn somewhere in the trees. 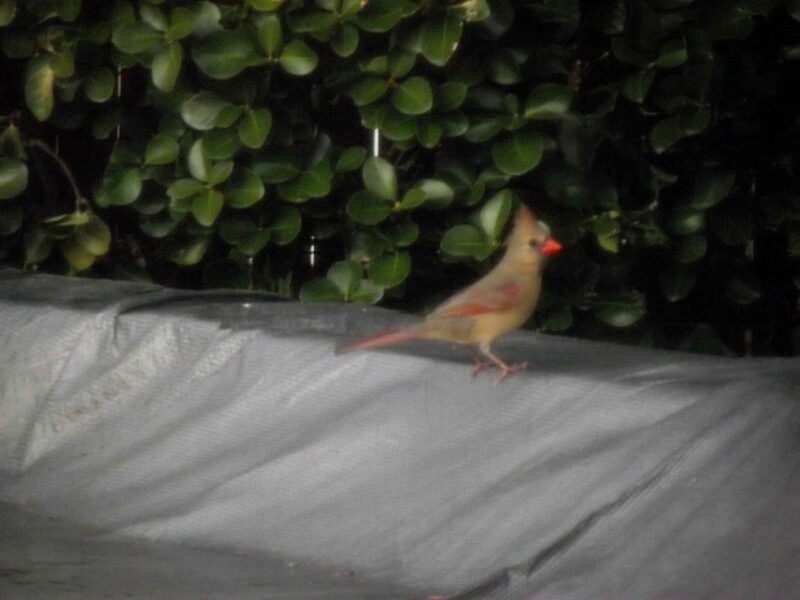 Unlike the blue jay, the cardinal isn’t aggressive at claiming food and standing its ground. I’ve seen blue jays tussle with one another for a peanut and one even push past a squirrel to get what’s his. The size of the cardinal’s beak allows it to eat a range of seeds and wild fruits. Many pictures of cardinals depict them with a berry in their mouth, a popular food choice. If you want to attract cardinals to your yard plant blackberries, dogwoods, wild grapes, and elderberries (also very good for us humans) to attract them. Like any other bird, cardinals need a source of clean water, and a bird bath with help bring these beautiful birds to your yard as well. When buying seed with the cardinal in mind, be sure the mix you purchase has generous amounts of safflower and sunflower seeds, a cardinal favorite. Though it’s been easier getting pictures of the male cardinal, recently I was lucky enough to catch a few shots of his partner. I’ve named this pair Constance and Carter. 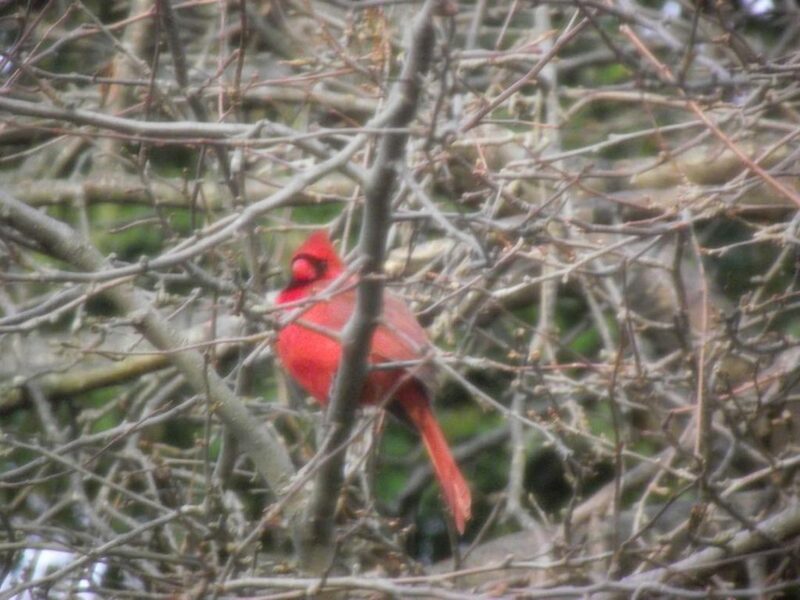 Carter’s red feathers certainly add some much needed color to my winter mornings. I hope you enjoy them too. I hope you’ll stop by next week on Wednesday Bird Watch for a visit with another beautiful bird at my feeders. Enjoy the rest of your week!